This is a prime lens manufactured by Nikon and the model was launched 2013. The lens belongs to the category normal prime lenses, a normal lens where you do not have the possibility to zoom in and out. The lens has a focal length of 58 mm. Depending on which camera the lens is used, the experienced and perceived focal length will be different. Please visit the list of compatible cameras below, it will provide the equivalent focal length you get on each camera. The lens brightness and aperture value is f/1,4. This aperture value indicates that the lens is extremely bright. This will make it so much easier shooting in darker environments where you do not want or can use flash lighting, for example in churches or at different sports venues. If you buy this lens it will come with a lens hood, whose model name is "HB-68". Text from Nikon: "A low-light powerhouse that shines in nearly any situation. 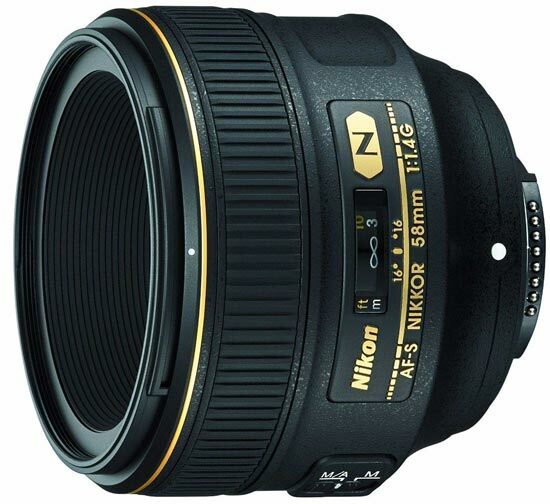 Go beyond the ordinary with the AF-S NIKKOR 58mm f/1.4G, a lens designed to excel in low-light and nighttime applications but with characteristics you´ll enjoy for so much more. Its fast f/1.4 maximum aperture produces outstanding evenly lit images with edge-to-edge sharpness—virtually no sagittal coma or light falloff. Its unique design and rounded 9-blade diaphragm produce stunning bokeh and depth of field control from f/1.4 to infinity—equally useful in daytime portraits and nighttime cityscapes. Whether you´re shooting photos or HD video, FX or DX-format, the AF-S NIKKOR 58mm f/1.4G offers thrilling new capabilities and inspiration. Detachable hood and soft case included."